Elle & Buddy by K.D Rausin and Muza Ulasowski is a beautiful children’s picture book that does not disappoint. This book is based on the real life experiences of a young girl, Arielle Rausin,who at the age of 10 was paralysed in a car accident. In 7th grade she was challenged by her P.E teacher to join the middle school track team. Her first few races were in an everyday wheelchair until she discovered racing wheelchairs. In high school she wanted to join the track team but was told she could not as they did not recognise adaptive sports. This lead to Arielle advocating for herself and, with the help of the community, developed an adaptive track program. Today Arielle Rausin is an athlete on the University of Illinois wheelchair racing team. 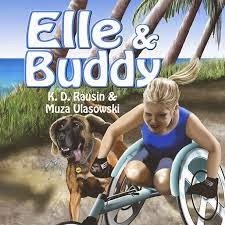 Elle & Buddy see’s the collaboration of U.S writer, K.D Rausin with that of Australian illustrator Muza Ulasowski. I have reviewed many books illustrated by Muza and each have delighted. Elle & Buddy did not disappoint. What I love about Muza’s illustrations is the way they jump off the page at you and engulf you in the event. With each illustration you feel as though you are really there and can reach out and touch the characters. There is delight within each picture that leaves you feeling excited and at times overwhelmed. Elle & Buddy is the second book by K.D Rausin but the first I have read. She has provided a delightful story that allows the reader to share the discovery and excitement of Elle. Elle and Buddy is informative and educational, opening your eyes to the lives and dreams of children in wheelchairs and the world of adaptive sports. Elle & Buddy is full of excitement and fun that children of all ages will relate to. For the younger child there is a Gecko hidden within each page. The relationship between the Gecko and Buddy provides an extra treat, and at times I questioned if Elle was aware of this relationship. The cheeky Gecko was definitely a winner in our household. I shared this book with my 7 year old daughter who has Autism. For her it was a special book about a special child. Although my daughters struggles in life are different to that of Elle we were able to talk about how each of us is unique with our own struggles. We spoke of adaptive sports and the special Olympics. We visited the Challenged Athletes website at the back of Elle & Buddy and read the timeline provide in relation to wheelchair racing. Elle & Buddy is an all round delightful package that will be enjoyed by all ages. With it’s inspiring story and delightful illustrations it is a book that will be read time and time again by children and adults worldwide. Congratulations K.D Rausin and Muza Ulasowski on a high quality children’s book that speaks of love, joy and understanding.